Vivec is a god in The Elder Scrolls III: Morrowind, whose enigmatic personality and power have led the Dark Elves (Dunmer) to worship them. 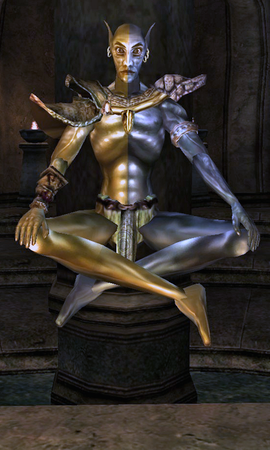 Vivec is described as “the magic hermaphrodite” with the ability to change their gender at will and has the physical traits of both the Dunmer and Chimer race. They are known to have relationships with Almalexia (a goddess figure) and Molag Bal via a brief marriage. It is said that Molag Bal fathered thousands of terrifying mutant offspring with Vivec. Vivec later made the ancient weapon Muatra “out of his love” representing both his male and female genitalia that was then augmented by something bit off from Molag Bal’s “spear” (thought to be male genitalia).